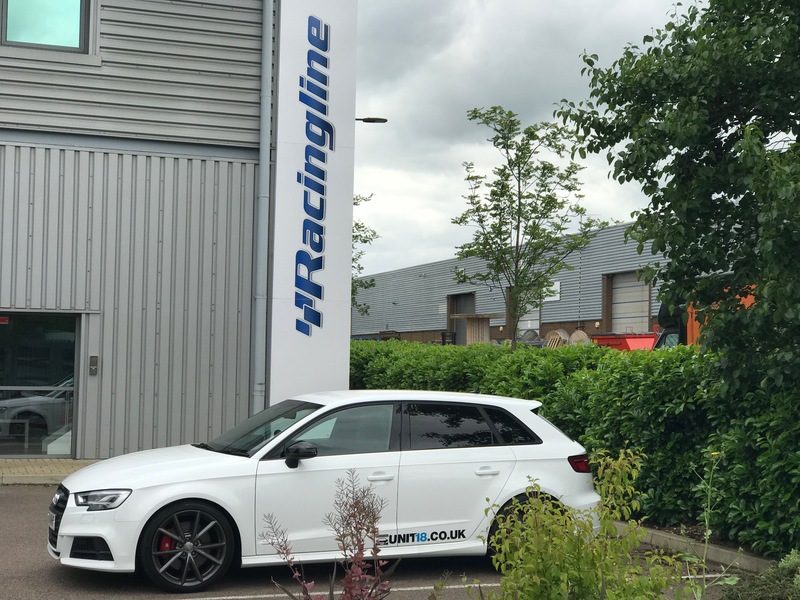 VW Racingline are one of our close partners, and when looking to modify the ride high and ride quality RacingLine was the obvious choice. Upon receiving the springs, that were hand delivered by RacingLine in person, we unboxed them in the workshop. 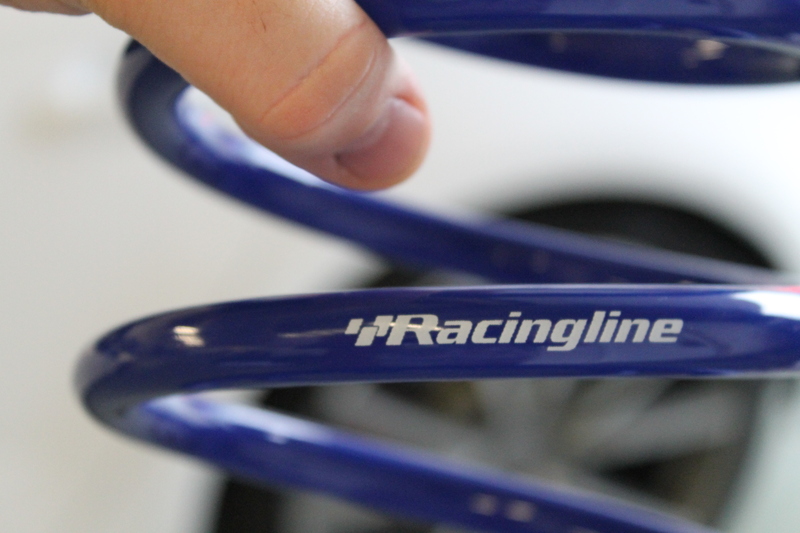 The quality of the springs is excellent, the finish in blue with the RacingLine logo is a nice touch and we couldn’t wait to get them on the car. 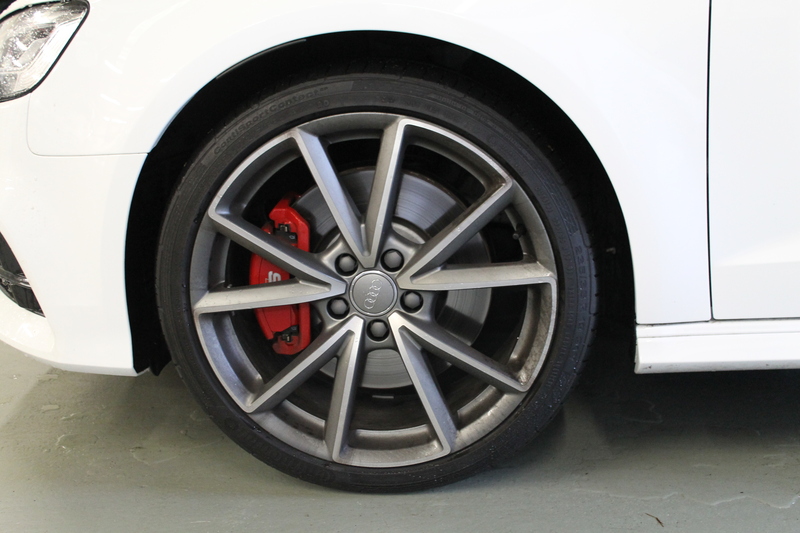 Our S3 has the optional Audi Magnetic Ride. Magnetic ride is where the dampening can be adjusted in the car based on the mode of driving selected. Two settings available are “Comfort” and “Dynamic”. The settings in comfort mode are designed for motorway and driving around town etc. The dynamic mode is more for fast road driving or track based driving. 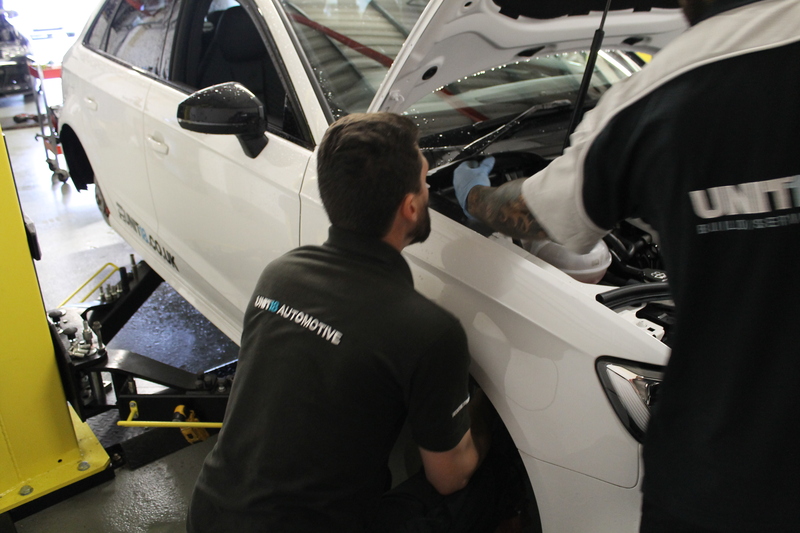 Our technicians fitted the springs, to the car and then performed a 4 wheel alignment using our Hunter alignment system. 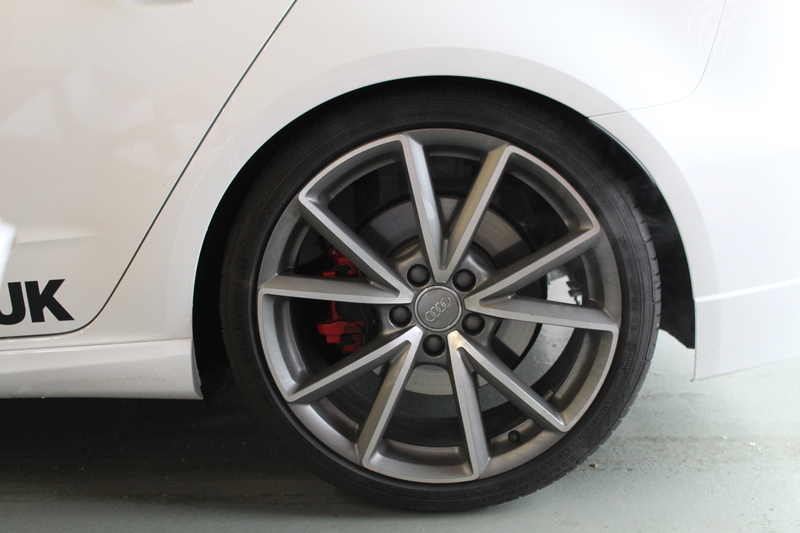 The car was set up with a more aggressive front camber to suite my driving style and to allow the car to exit corners better during fast road driving around Milton Keynes. Below are some images of the front and rear wheels on standard springs. 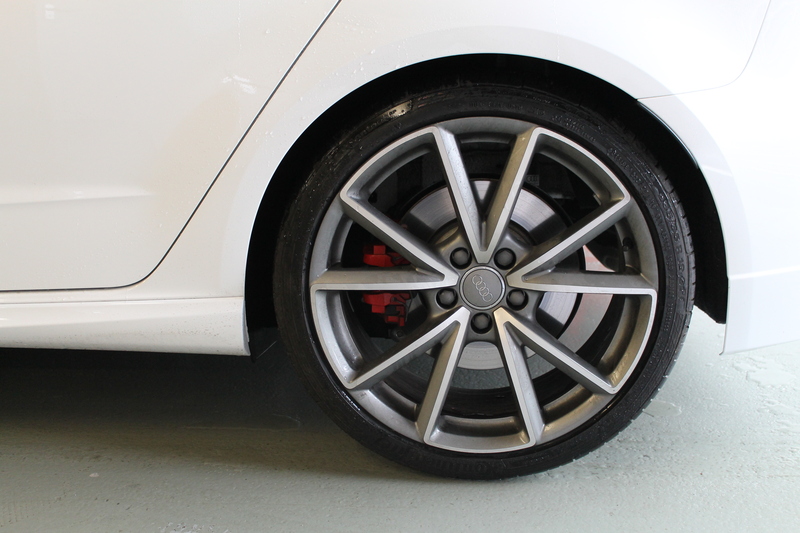 Below are the images of the front and rear wheels immediately after the VW Racingline line springs have been fitted. The ride has dropped around 20mm front and 30mm rear. Placing the top of each tyre into the wheel arch. Below is a breakdown of how we have observed the ride quality change in each of the driving modes. Rebound: The rebound has changed significantly, there is less rebound when traveling over speed bumps and large dips or hols in the road. This, in my view, makes the car more stable and controllable when driving. A vast improvement over the standard springs. Stiffness of ride: The new springs are slightly stiffer than the originals. However this is only noticeable in certain circumstances on bad road surfaces. Roll and corner entry: Inline with the rest of the feedback, the slight increase in stiffness of the springs reduces the roll and allows better turn in when cornering at speed. This paired with the increased camber on the front wheels makes cornering more predictable and tighter. Stiffness of ride: The increased dampening stiffness in dynamic mode, with the increased stiffness of the RacingLine springs, makes very little difference to the ride in dynamic driving mode. The ride was always stiff and unforgiving in dynamic and it is very much the same with the RacingLine springs. Roll and corner entry: The roll has been slightly reduced in dynamic mode and as a result, much like in comfort mode, turn in for cornering is much more direct and gives much more confidence when driving on the track. The above changes we observed over 2000 miles of driving. Both modes were driven around town, dual carriage way, track and a number of different A roads. 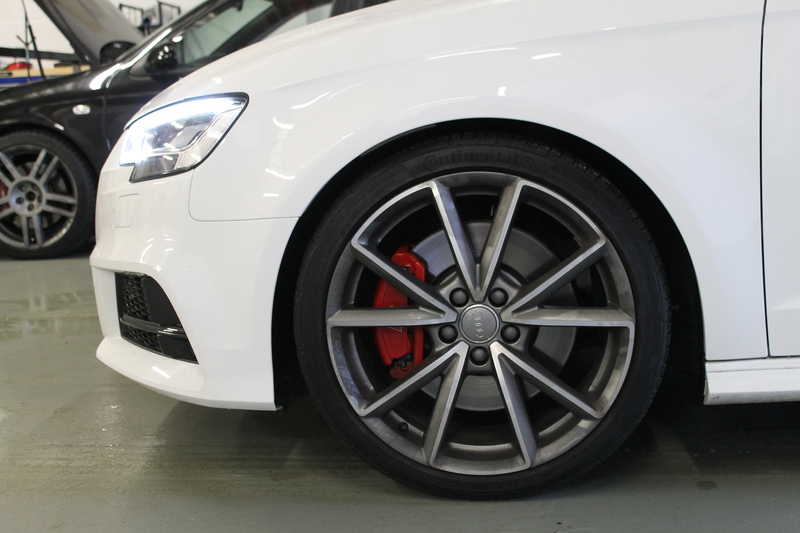 The RacingLine springs have been a great addition to the S3 and have reduced the ride height to an acceptable height. Not too low and in our view is how the car should leave the factory. The majority of changes are seen in “comfort” mode. Rebound is reduced and corner turn in, is much more predictable and improved. 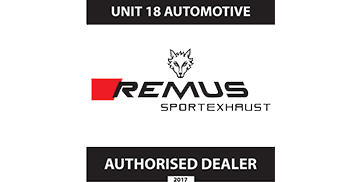 For more information on RacingLine springs, including if we stock a spring for your mode of car, call email of drop into the unit and speak to us.